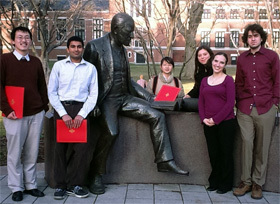 Undergraduate poster session winners (left to right): Zhen Chen (WPI); Abhijit Srungavarapu (Clark University); Tianjie Zheng, Charlie Rostan, Lauren Shepard, and James Parichy (Sarah Lawrence College). The 29th Harry Allen Symposium will take place on Saturday, March 23, 2019 at 1 PM in Johnson Auditorium (Rm S120) in the Sackler Sciences Center. "Chemical Tools to Monitor and Manipulate the Proteome"
For eligibility for the poster completion, the work presented must have been predominately the work of students who were undergraduates at the time, and the poster must be presented at the symposium by current undergraduate students. Space is limited. No more than two submissions per institution will be accepted before March 8th, 2019, on a first-come, first-served basis. If there are spaces remaining after that time, additional posters will be accepted on a first-come, first-served basis. All abstracts must be submitted no later than midnight, March 15th, 2019 for consideration for the competition. Prizes will be limited to no more than one per institution. Poster submissions from non-undergraduates will be considered for display on a space-available basis, but will not be considered for the competition. Decisions on the acceptance of posters will be sent to the contact author by March 18th, 2019. Please fill out the 29th Harry Allen Jr. Symposium registration form to register for this event. The event and registration is FREE and open to the public.